What a wonderful gift to mankind! From the opening line to its very last word, the Twenty-third Psalm, David's song of praise and prayer of affirmation, brings reassurance and confidence to all who reach out for it in times of need. It's the most popular and famous of all the Bible verses. 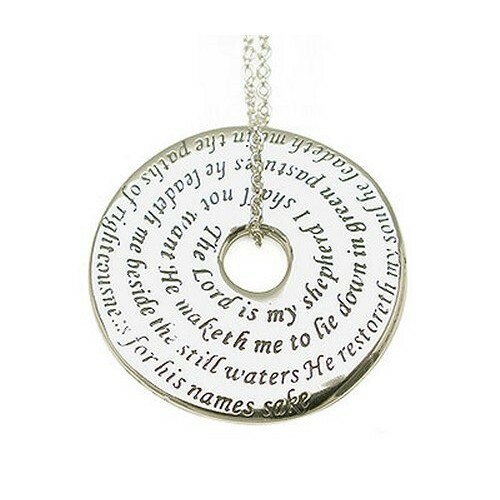 Enjoy the first verse as shown above, on a beautifully engraved sterling silver pendant. Elegantly strung on a 24" black satin cord or sterling silver chain it's a classic piece of jewelry. Take it off the cord and you have a comforting touchstone to tuck into your pocket. Touchstone with black silk cord and a sterling silver chain for two 'looks'. Comes in a gift box ready for gift giving.